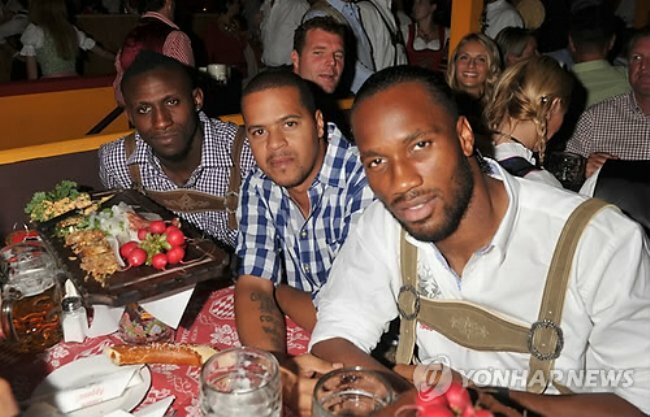 Ivory Coast teammates Didier Drogba and Steve Gohouri donned thier lederhosen and flew out to Munich on Sunday afternoon to sample a wee smidge of the Oktoberfest festivities currently engulfing the city and, by all accounts, had a gay old time – though not quite as gay as a member of the German press would have it. Midway through the evening, a reporter for a local news channel unwittingly referred to Gohouri as Drogba’s ‘boyfriend’ – which apparently caused the pair to break out in a fit of girlish giggles and secretly hold hands under the table for the rest of the night. @ Chris —- love the caption :)!!! They all came with the same purpose: To support Manuel Neuer’s Kids Foundation with their Donations.“. 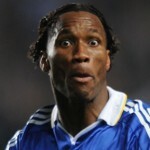 superstars Didier Drogba and Steve Gohouri as well as former Miss World Rosanna Davison. charity event it`s a must to wear the traditionel Bavarian Costume. Didier Drogba, Ivorian world‐class striker from Chelsea find there are lot of synergies for his own Foundation who is building an Hospital in Ivory Coast ( La Fondation Drogba) and also participate, together with Steve Gohouri on Manuel Neuer’s Project . foundation to this Event shows how important this matters to him. Xenija A. and Indira M..
Camp Drog always cracks me up!